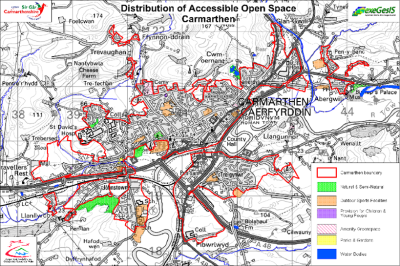 exeGesIS undertook an analysis of Greenspace and Public Open Space in Carmarthenshire for 21 major and 51 minor settlements. The results were compared against the standards in the CCW Greenspace Toolkit and play space standards based on National Playing Fields Association guidelines. Data were collated to create a dataset of candidate Greenspaces, an access network dataset and an access point dataset, all of which were checked by local authority staff. In addition the data was validated by undertaking a survey of greenspace type, condition and access points for a sample of 250 non-Local Authority sites. Population for each settlement was calculated from national census data. Analysis was undertaken to determine the area within the distance criteria for each Greenspace access point. These data were then used to calculate the percentage of the population in each settlement which passed the criteria. The results were reviewed by local authority staff via a website, which allowed comments to be left and read by others. The data was then reprocessed to produce the final outputs. Further information from Claire Lush.